One cubic feet of green wood sample contains about 16 liters of water and it requires seasoning. After seasoning a significant amount of water (2.7 litres) still remains in the wood. If wood is not seasoned, defects like warping, cracking and twisting occur. A number of models representing different methods of air seasoning, steam seasoning and solar kiln seasoning are on display. Timber engineering techniques using short dimensional timbers for large span of trusses are depicted. Cabinet designing is demonstrated using different timbers and various patterns. The center of attraction, however, is a transverse section of a 704-year-old Deodar (Cedrus deodara) tree, which was felled in 1919 from the hills of U.P. The natural and climatic events can be clearly traced by reading the annual rings. Depiction of Indian history starting from the date of construction of Qutub Minar to Jalianwala Bagh incident made on this exhibit makes it very interesting. Another section displayed is that of a 330-year-old teak (Tectona grandis). Walnut and Padauk burr(outgrowths on the stem) specimens are also items of interest. Popular and inexpensive use of plywood, laminated wood, compregnated wood, bamboo boards and diaper are demonstrated and bamboo and wooden springs for furniture and other articles are displayed. Comparative mechanical properties of different timbers are depicted for various end uses. 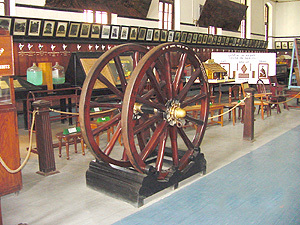 There is a gun carriage wheel made of rosewood, shisham, and Andaman Padauk. An exhibit of this museum shows a comparison between the conventional resin tapping technique and the newly developed rill method for resin tapping. Samples of turpentine oil and rosin, and a variety of species of bamboo found in our country make a unique collection. Exhibits also include samples of miner forest products such as katha, cutch, Lac products, essential oils, edible products, fatty oils, spices, drugs, tans, gums, etc. There are exhibits showing walking sticks, batons, sports goods, paper, matches, baskets, and products from grasses, leaves, flosses, etc. This museum depicts the effect of environment with and without trees on productivity and economy of the villages. Photographs and Models show effect of tree growth on fuelwood, fodder and other forest products. Models show the nursery techniques for raising planting stocks, planting techniques and various protective measures for the plants. Models of improved smokeless chulhas to demonstrate the efficient use of fuelwood. Exhibits demonstrate the possibilities of establishing suitable cottage industries based on social forestry products and role of social forestry in providing employment, particularly to the landless people. Forest Pathology museum houses 900 exhibits of various economically important tree diseases and timber decays. Exhibits are arranged on the basis of two broad host groups: hardwood and conifers. These are further divided according to the part of the plant affected namely root disease, stem disease and foliage disease. Important tree diseases such as heart-rot in khair, sal, teak and deodar and root-rot in khair, sal and pines have been displayed. Degradation of timber and timber products caused by micro- organisms are also displayed. Beneficial role of fungi as mycorrhiza to establish and promote tree growth especially in pines and the value of fungi as a source of food are also displayed. This museum contains about 3,000 exhibits representing the various stages of insect pests and the nature of damage caused by them to seed, seedlings, standing trees, felled timbers, bamboos and also finished products. 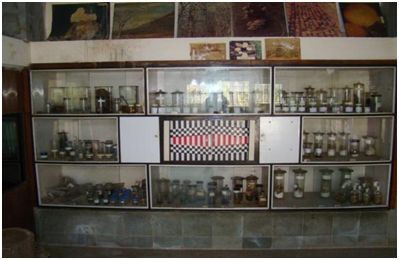 Exhibits are arranged alphabetically according to plant genera. Important forestry pests like sal heart-wood borer, teak defoliator, Meliaceae shoot borer, poplar defoliators, deodar defoliator, sissoo defoliator, babul stem and root borer, their biology, life history and nature of damage have been depicted along with methods to control them. Some of the insecticides and their application equipments are also exhibited. A depiction of the life history of termites and their control makes a very educative piece. Various commercial timbers have been graded according to their termite resistance property. The Institute has an Insect Reference Collection of more than 700 identified insect specimens occurring in central India. This Insect Reference Collection maintained by Forest Entomology Division is a National Insect Repositorydeclaredby the National Biodiversity Authority (MoEF&CC, Govt. of India), particularly for the insect orders: Lepidoptera and Termites. The repository is the largest collection of identified insects in the region with identification services available for the researchers facilitating the insect management and assessment of biodiversity. A mycology herbarium of forest fungi exists at the institute with over 3500 specimens systematically arranged in herbarium cabinets. An identification service for forest fungi is available from the institute. TFRI has recently raised an "Arachnarium" for the first time in India, in the form of three indoor and outdoor components (laboratory, interpretation centre and spider garden for in situ demonstration), where spiders are not only reared in laboratory conditions, maintaining a natural environment but also a unique place for display so that the role of spiders as component in the environment is displayed. Apart from preserved spider specimens collected from all over India in the Arachnarium, there would be exhibits of live spiders. To begin with, 50 species of spiders have been included in the Arachnarium. Some extraordinary spiders, like the fish eating Pisaurids and bird eating giant wood spider would get prime focus. Arid Forest Research Institute, Jodhpur is extending its research reach out by extending research output to stake holders through Division of Agroforestry and Extension. 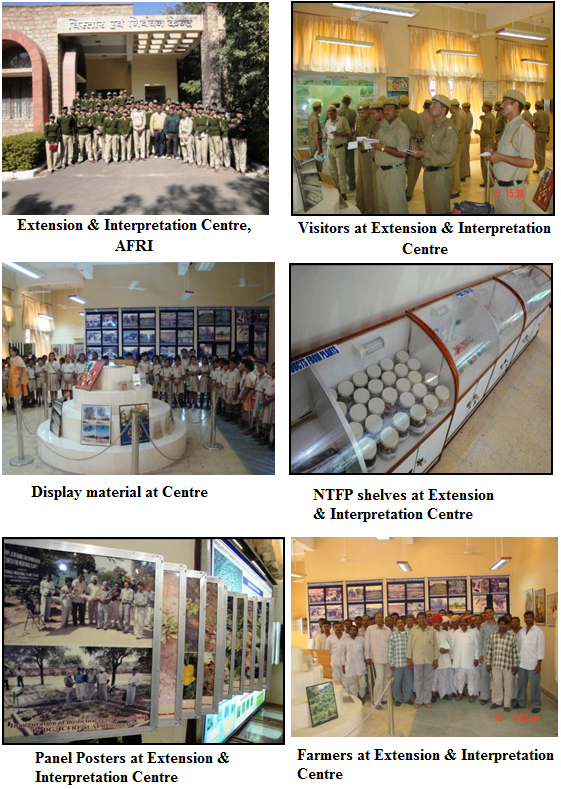 It has carried out extension works through multifarious approaches encompassing organization of educational/eco-sensitization/ capacity building/technology transfer training programmes; collaborative forestry research extension programmes; exhibits display of activities; publications of extension bulletins/ handouts, brouchures, leaflets, pamphlets and paper presentations / publications in print media. There is a well equiped Extension & Interpretation Centre under Agroforestry and Extension Division, AFRI to show case our research findings to the end users. 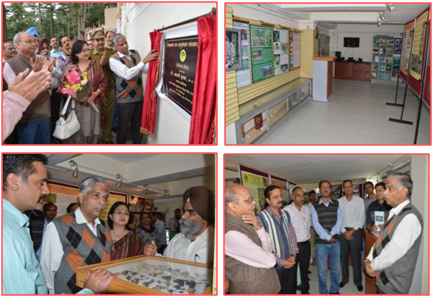 The extension and interpretation centre was opened to the visitors for technology dissemination. Centre was inaugurated by the DG, ICFRE on 04.07.2004 during his visit to the institute. Basic building infra-structure was available with the Institute. Items of work like; fabrication of folding metallic poster album, backlight printing board, display boards, fixing of building name letters, curtain rods etc were taken up. Display boards on research findings and technologies developed for transfer to the end users were prepared after in house discussion with the scientists & officers. A Farmer’s Galary was also established in this centre. In this gallary information is displayed in Hindi language through large display boards. Approximate 50-60 people can attend presentation/lectures through audio visual facilities at the Centre. Almost every year some kind of display material is added to this centre. Some LED posters, scroll posters and acrylic posters were recently displayed here. Various groups of stakeholders like farmers, students from schools, colleges & universities, members of NGOs, Forest officials, frontline forest staff and trainee forest officilas are frequently visit this centre. On an average, about 1500 people visit annually to the Centre. 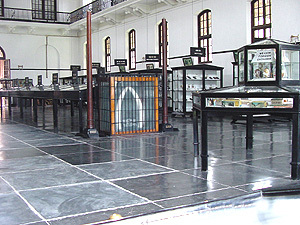 The institute had established a small museums (Interpretation Centre) in the basement of M.D. Chaturvedi Multi-purpose Training Complex of the institute, which was inaugurated by the Director General, ICFRE, Dehradun during November, 2015. Efforts have been made to showcase the various research and extension activities carried out by the institute in the past. 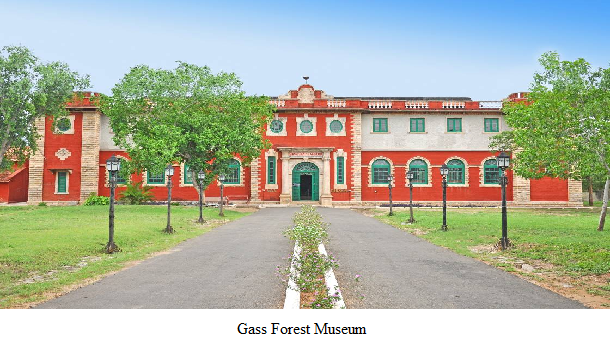 The Gass Forest Museum, one of the oldest in Asia, initially started as a Forest Museum at Madras by J.S. Gamble, the then Conservator of Forests, Madras state towards the end of 19th century. Later the present museum was initiated in 1902 by Mr Horace Archibald Gass, the then Conservator of Forests, Coimbatore circle in the Conservator’s office building. The museum grew up occupying the office rooms of the District Forest Officers (North & South), Coimbatore and the erstwhile Government subsequently sanctioned the construction of a building on 24th March 1905 and appointment of Curator on 01st April 1905. The construction of new building commenced in April 1905 and completed in 1906 at a total cost of Rs. 8,860/- . The new museum building was opened by Sir Arthur Lawley on 05th September 1906. “In recognition of the fact that the establishment of the Forest Museum at Coimbatore was due to the personal initiative of Mr. H. A. Gass and that its present successful development is due to the energetic interest which he has taken in it, during the tenure of his office as Conservator of Forests in the Southern circle, His Excellency the Governor in council is pleased to direct that the Museum be hereafter known as “The Gass Forest Museum”. 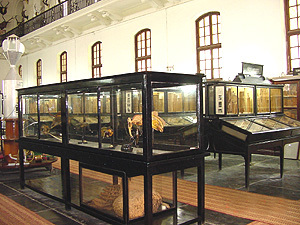 Restoration work of Zoological specimens like antlers, skulls, animal skins and mounts & anthropological specimens like arms, tribal dresses and jewels were carried out under the supervision of experts from Chemical Conservation & Research Laboratory and Zoology department from Government Museum, Chennai. Besides, a Taxidermist from Government Museum, Salem and an Artist modeler from Government Museum, Karur took part in restoration of the models. Repair and renovation of stuffed specimens, skulls and skeletons were undertaken by engaging taxidermists. Three dimensional diorama to resemble natural habitats of wild animals were created by using natural materials like soil, boulders, tree trunks etc., Life sized models of wildlife and vegetation were also made . A Bamboo and rattan museum was established in the year 2013 and thereafter, samples are gradually added in its collection. It has a collection of preserved samples of 23 bamboo species and 04 rattan species. 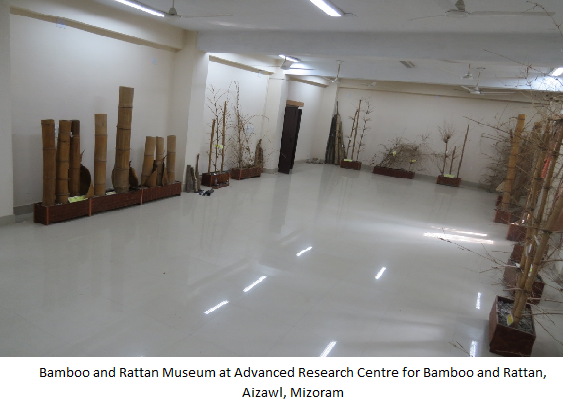 A feature of special attraction of the museum is its collection of preserved flowering twigs of different bamboo species such as Dendrocalamus longispathus, Dendrocalamus hamiltonii, Dendrocalamus strictus, Bambusa mizorameana etc. Value added bamboo products such as Bamboo charcoal briquettes and bamboo vinegar is also displayed. Participants of all the trainings and meeting always visit the museum. .